When a loved one suffers a heart attack or experiences a heart-related emergency, every minute counts. Learn what happens during a heart attack, and how local cardiac teams respond when every minute counts. Heart disease is the No. 1 cause of death in the United States, for both men and women. That fact really hits home when a family member, friend or colleague is diagnosed with heart disease or rushed to the hospital with the agonizing symptoms of a heart attack. Lamounier explains that physicians listen closely for murmurs and, when one is heard, take steps to evaluate how seriously the heart is affected. They use echocardiograms to determine which valves are malfunctioning and whether there are any structural problems. 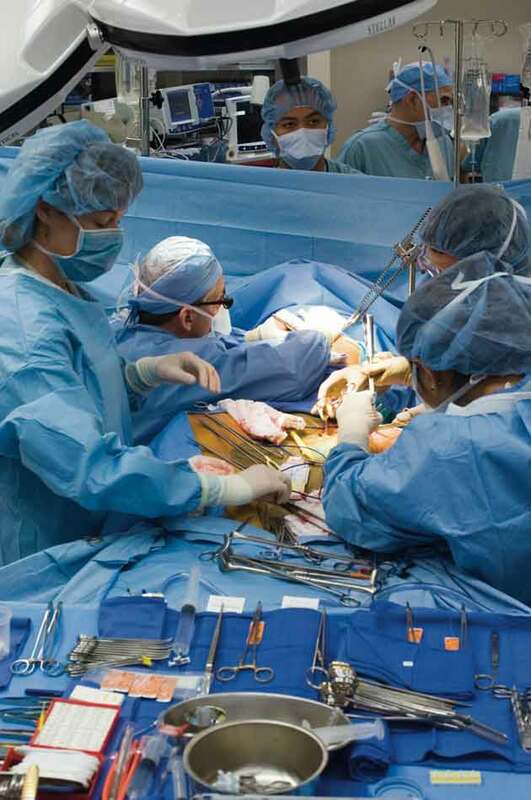 Open-heart surgery begins by hooking up the patient to a bypass or heart-lung machine. 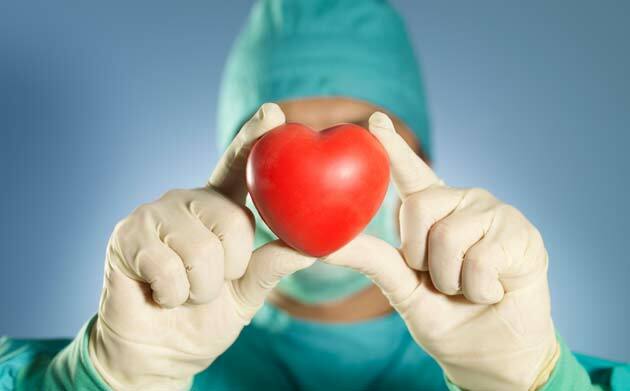 Then, surgeons stop the heart, repair or replace the faulty valve, and restart the heart. Patients usually stay in the hospital for three to seven days and resume normal life in about four weeks. Changes in lifestyle can lower risk. “Controlling high blood pressure, enjoying a vegetarian diet, appropriate exercise – all those things that help to keep a heart healthy will also help patients to avoid valve disease,” says Lamounier. Open-heart operations, such as this one at Centegra Health System, Crystal Lake, repair faulty heart valves. When heart disease leads to heart attacks, swift intervention is vital. As a board-certified emergency medicine specialist at Delnor Hospital, Geneva, Dr. Arnold del Mundo is the first to see patients experiencing such symptoms. The trouble is that some patients exhibit classic symptoms, while others present with lesser-known problems, says del Mundo. On rare occasions, no warning signs are visible. 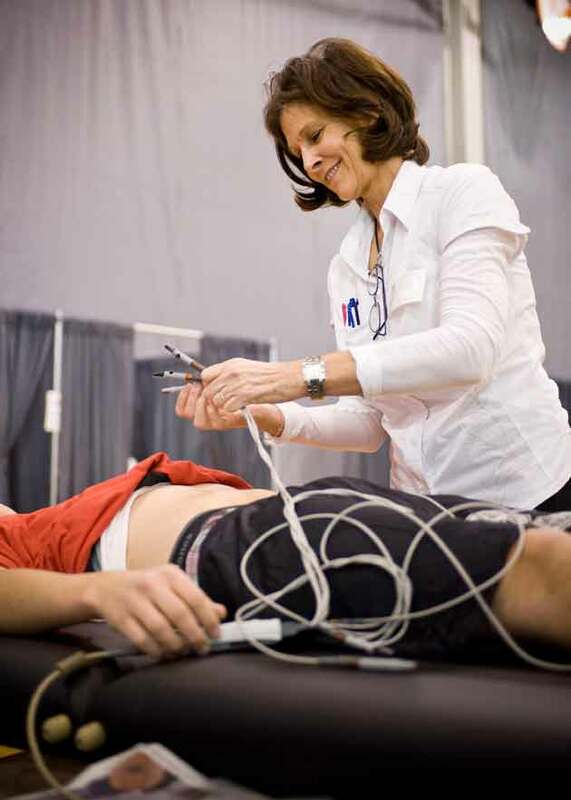 When a patient shows a possible cardiac emergency, nurses initiate chest pain protocols which include obtaining initial vital signs, doing an electrocardiogram (EKG), placing the patient on supplemental oxygen, starting an IV and drawing blood samples. 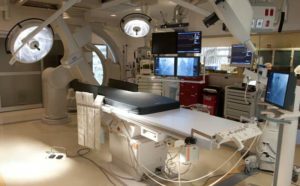 If del Mundo determines that a patient is having a heart attack, he calls a “cardiac alert,” which pages the interventional cardiologist and mobilizes the cardiac catheterization team. Delnor Hospital has cardiologists available for around-the-clock emergency catheterization as the first line of therapy. Patients who have heart attacks with no warning symptoms may have experienced a plaque rupture from the lining of a coronary vessel, says del Mundo. Platelets then clot on the rupture, blocking blood flow to the heart muscle and causing a heart attack. In any case, the most important thing anyone can do is to get medical help as quickly as possible. When potential heart attack patients arrive by ambulance at Provena Saint Joseph Hospital, Elgin, they’ve already been assessed and treated by emergency responders, says Dr. James Burks, an interventional cardiologist. The code cardiac team includes an interventional cardiologist, at least two nurses, one scrub nurse and one radiology technician. The team assembles day or night. While an assessment is conducted in the ER, part of the team gets equipment up and running in the cath lab. The rush to unblock the artery begins with a tiny, catheter-guided wire inserted through an incision in the groin. The wire is worked through the blockage and a balloon is fed through. The balloon is pulled back and a repeat angiogram performed. This helps Burks to decide the proper length and diameter of stent needed to maintain the re-opened artery. Inside the cath lab at Provena Saint Joseph Hospital, Elgin. While stents are most commonly used in emergency procedures, they also can be inserted after a patient presents with abnormalities during stress tests. Bare metal stents were used previously to hold the arteries open, resulting in a 20- to 25-percent drop in vessel stricture, a good improvement. However, the latest advancement uses dissolving stents, mesh coated with medications, which reduce scarring. The coating also reduces recoiling and lowers the risk of new blockage. Heart attacks aren’t the only heart conditions that bring people to the emergency room. Atrial fibrillation (A-fib) is one of the more common heart conditions that ER doctors diagnose. As director of invasive cardiology and the cardiology catheterization laboratory at Advocate Good Shepherd Hospital, Barrington, Dr. Douglas Tomasian describes common symptoms of A-fib as a rapid heart rate or palpitations combined with shortness of breath. Several conditions can influence the development of A-fib, including valve disease, heart failure and blocked arteries. A-fib also may be triggered by conditions such as lung or thyroid disease. Most often, A-fib is considered to be its own cardiac condition, and is very common among patients reaching retirement age. Attempting to normalize the patient’s heart rhythm is often the next step, using specialized medications or electrical cardioversion, done under sedation. Despite these measures, the arrhythmia of A-fib will recur in many patients. Tomasian says that in certain patients, a minimally-invasive procedure known as an electrophysiology ablation may restore a normal rhythm and prevent recurrences of A-fib. After treatment, patients stay at Good Shepherd Hospital overnight for observation. In most cases, patients are back to normal activities in a couple of days, often with much more energy. Follow-up and outpatient monitoring are required, but in many cases there is no further need for hospitalization. A nurse at Advocate Good Shepherd Hospital in Barrington evaluates a patient for unusual heart rhythms. Tomasian emphasizes that A-fib is a common cardiac problem that may cause symptoms and serious complications, such as stroke. It’s often a recurrent problem that requires management through medication and cardiac follow-up. New technologies, such as catheter-based or minimally-invasive electrophysiology ablation procedures, have become a popular treatment option. Newly-diagnosed patients and their families are confronted with a bewildering barrage of heart-related medical terms. Aalfs lists viruses, drugs and alcohol, hypertension, abnormal heart valves, coronary artery disease, uncontrolled cholesterol, unhealthy diet, kidney disease, irregular heartbeat and diabetes among potential causes. A coronary attack (heart attack) may also cause heart failure. This entry was posted on Wednesday, August 31st, 2011 at 12:00 pm	and is filed under Health & Fitness, Top Posts. You can follow any responses to this entry through the RSS 2.0 feed. Both comments and pings are currently closed.